How’s life on the ranch during the 11th season of the Heartland TV show on UP? As we all know, the Nielsen ratings typically play a big role in determining whether a TV show like Heartland is cancelled or renewed for season 12. Unfortunately, most of us do not live in Nielsen households. 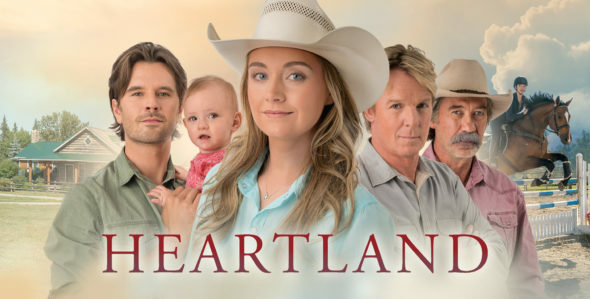 Because many viewers feel frustration when their viewing habits and opinions aren’t considered, we’d like to offer you the chance to rate all of the Heartland season 11 episodes here. An UP family drama, Heartland originates on Canada’s CBC. The cast includes Amber Marshall, Graham Wardle, Michelle Morgan, Chris Potter, Alisha Newton, Shaun Johnston, Jessica Steen, Kerry James, Gabriel Hogan, and Nathaniel Arcand. The scripted TV show centers on the tightly-knit Bartlett-Fleming ranching family of Hudson, Alberta. It follows their challenges and adventures on the Heartland ranch, where they treat and re-home horses with special needs, due to neglect, or worse. In the 11th season, everyone has to get used to having a new baby around.